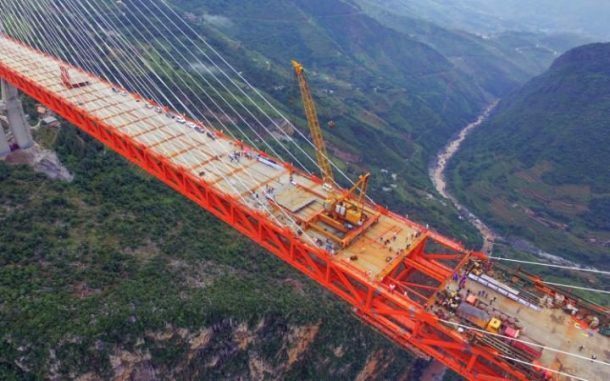 A few months back, China retook the honor of hosting the highest bridge in the world, and now the record breaking bridge is reportedly open for all vehicles. The Beipanjiang Bridge took over $140 million and a period of three years to be built in southwest China, and stands at 1,854 feet, making it highest in the world due to the vast distance between the ground and the bridge’s deck. 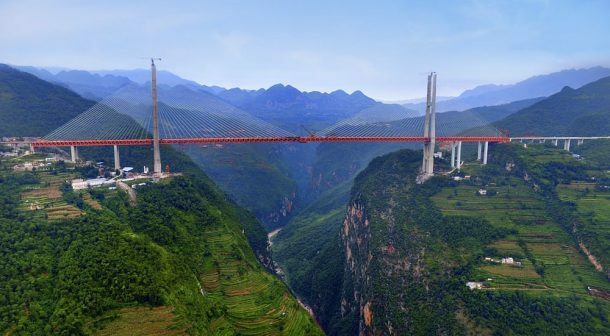 This marvel of engineering connects the Beipanjiang Valley and stretches between the Yunnan to the Guizhou provinces. The once five-hour journey has been brought down to an hour and a half, as people can now walk on this 4,400 feet long bridge at the mind-boggling height equal to a 200 story building. Construction of this astonishing bridge was not an easy job, with the high-speed wind being the first of many problems. The builders had to be precise in assembling bridge sections on the site, and according to CCCC Highway Consultants deputy chief engineer Liu Bo, their primary challenge was to locate where to place bridge piers in the 1,640 feet deep gorge beneath the bridge. Although once considered a nearly impossible task, the Beipanjiang Bridge now stands high, making us marvel at the wonders of engineering. Have anything else to add to the above information? Let us know in the comments’ section below!